Why not stop by and join us for recipes and inspiration, little slices of Italian life, and more. Italian Panettone with a Tiramisu flavoured cream, coffee syrup, amaretti and a chocolate topping. Made with butter, baked to a traditional recipe using a mother dough that has been lovingly nurtured for generations. 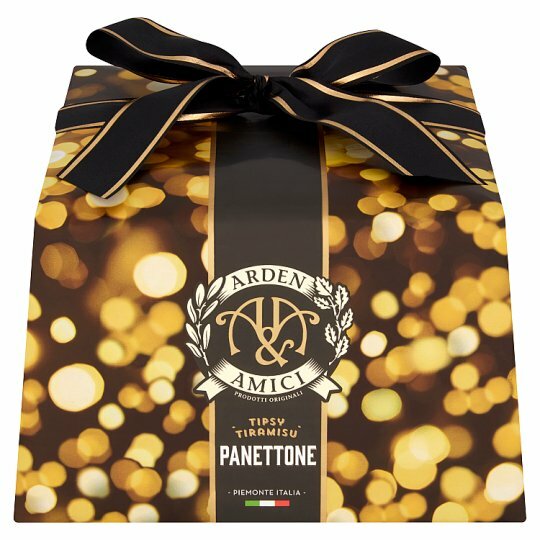 Our Panettone originates from a small bakers' shop in Turin and was first made in the early '6os by friends Vincenzo, Antonio and Bruno. After building their first bakery in an old convent, their Panettone soon became a firm favourite throughout Italy and across the globe. The business is now run by their sons and daughters and the passion for quality lives on as the next generation continue to lovingly nurture the unique Mother Dough as their fathers did for generations before them. You cannot escape the sense of tradition and pride running through this family business as well as their love of great food, wine and friendship. Store in a cool dry place. Once opened, for maximum freshness, reseal bag after every use and consume within 7 days.